Single-mom guilt is like a millstone around my neck, constantly dragging me down. I can’t win. Am I the only one who feels this way? Everyone else seems to have a perfect Facebook life. I am the only one who doesn’t have a perfect life. That was me when I first separated from my husband. Do you ever feel that way too? Your kids are being raised by parents who don’t live together. You got divorced and didn’t keep your “until death parts us” promise. You go to work instead of being home with your kids. You are home with your kids instead of working. You can’t afford some of the things your kid’s friend’s parents can afford. Your special-needs kid acts out (or your not-so-special-needs kid acts out). Some days, you want to take a break from your kids. You serve too many convenience foods. You turned your little’s favorite white t-shirt pink in your rush to get it clean. 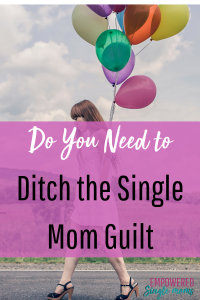 Are You Alone in Dealing with Single-Mom Guilt? Most parents feel guilty about some aspect of their parenting. Getting divorced and being a single parent gives you a truckload of extra opportunities to feel inadequate. Guilt can crush you. But really, it isn’t guilt. It is shame. 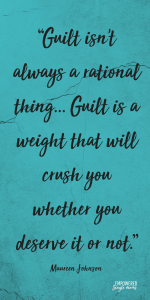 Guilt can be a normal, healthy feeling reminding us we did something wrong. That type of guilt signals us to solve a problem. Guilt is healthy if it comes briefly, reminds us to correct a mistake, and then we can move along. Shame is the feeling that you are a bad person, and it leads us to beat ourselves up and focus on what terrible, unworthy, damaged people we are instead of focusing on solutions. Shame is a shroud of toxicity. Because shaming yourself does no good, focus on doing the best you can. If something is not very good, work to improve it. Start where you are, solve problems, and set goals to be the best person and best parent you can be. Shame usually walks in when we are focusing on the past and what we should have done. Only consider the past to the extent that it facilitates a better future. Examine what happened and how you can improve on it. Make a plan, work your plan, and keep moving forward. Sign up for our four-day parenting challenge and get your parenting confidence back. Don’t get stuck in a past you cannot change. When you live mindfully in the present, guilt and shame have little chance to set up camp in your mind. Think in terms of the present and what you feel grateful for. Don’t abdicate responsibility, but focus on what you have control over and how to make your life better. Then, optimize and improve. Let’s talk about some of the typical causes of single-mom shame. When you are a single parent, it is hard to balance work and everything that goes into being the best parent you can be. It may seem like there’s never enough time to do everything the way you’d like to do it. To get rid of single-mom guilt, focus on solutions. One of the most common sources of single-parent guilt is the feeling that you don’t spend enough time with your children. Instead of thinking about the time you’ve missed, ask yourself, “Where can I find that additional time?” Be creative. Can you adjust your work schedule so you are doing more of your work when they are at school, with the other parent, at their activities, or sleeping? Brainstorm your options. For example, is there a way to bring your children to work? If you own a business, could you involve them a few hours a week in what you are doing? I would sometimes do my business paperwork or reading in the same room with my children while they completed homework. Sometimes, store or restaurant owners’ children help out at the family business. A few nights ago, I was at a family-owned Mexican restaurant where one of the owner’s kids was doing a great job of serving chips and salsa to the guests. Even though you know it’s not the best option, is easy to fall into a habit of serving your kids convenience foods or fast-food meals. Do you feel guilty because you’re not sure how to get healthy, balanced meals on the table? I did. But there is a solution. You can read more about family meals and how to make them possible here. 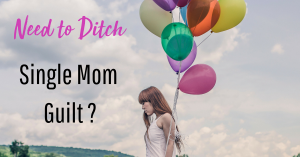 Do you need to ditch your mom guilt? instance, could you go on family walks, bike rides, or rollerblading outings? Video workouts can be great fun for kids to try alongside a parent. Older kids may want to tag along to the gym. I wrote more about how to solve problems here. Say goodbye to the guilt. Silence the shame. Be a good friend to yourself. Live in the present and give yourself as much grace as you would lavish on your best friend. Evaluate your situation. Identify what you have control over, make a plan, and work the plan. I also want you to think about this: All those perfect Facebook lives? That is fantasy. It’s not at all true. Almost everyone has something that is not going right in their life, and if they don’t now, they will soon. Think about your close friends and family members. I would be surprised if one of them didn’t want to change something about their life. No one has a perfect life. When you compare the inside of your life to someone else’s outside, of course you will come up short. However, there is a cozy place between shame and guilt and a “perfect life.” I finally found this happy place and I know you will too. Because we all need support, I started a Facebook group where you can find other moms you can relate to. You can join here.